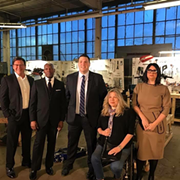 Cleveland Chain Reaction, from Alan Glazen and co., has chosen Slavic Village as the neighborhood that will receive investments for five businesses, beating out West 25th and Clark in Clark/Fulton, East 185th in North Collinwood and East 50th to East 69th in St. Clair/Superior. 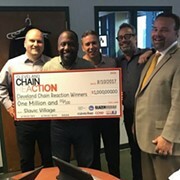 Chain Reaction is an offshoot of the LeBron James/Maverick Carter-produced Cleveland Hustles reality show that was broadcast on CNBC last summer that was responsible for the growth of businesses like Cleveland Bagel and Fount in Detroit Shoreway. 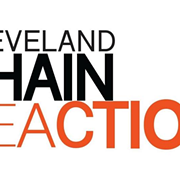 The five Chain Reaction investors— the Cleveland Foundation; Fred Geis; Andrew Jackson of Elson's International; Justin Miller, owner of CleanLife; and Claudia Young of Citizen Pie — have committed at least $650,000, or at least $130,000 per business. Cleveland Neighborhood Progress partnered with Chain Reaction to help select which neighborhood would receive the investments. The next step is for COSE to narrow the search down to 24 businesses that will present their proposals in front of the investors. Have a business in Slavic Village that needs an influx of cash? You can apply at clevelandchainreaction.org to apply to be a part of the deal.